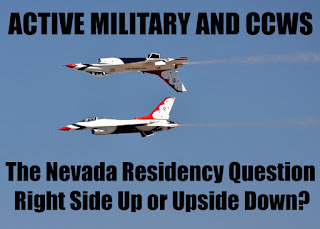 If you are active duty military, do you need a Nevada issued concealed firearm permit? Exactly when do you become a resident of Nevada for the purposes of needing concealed carry? The regulations, NRS 202.3653 to 202.369, don’t offer any guidance, so we have to look at other Nevada statutes and case law. The only easy answer to this one isn't what you may have hoped for. 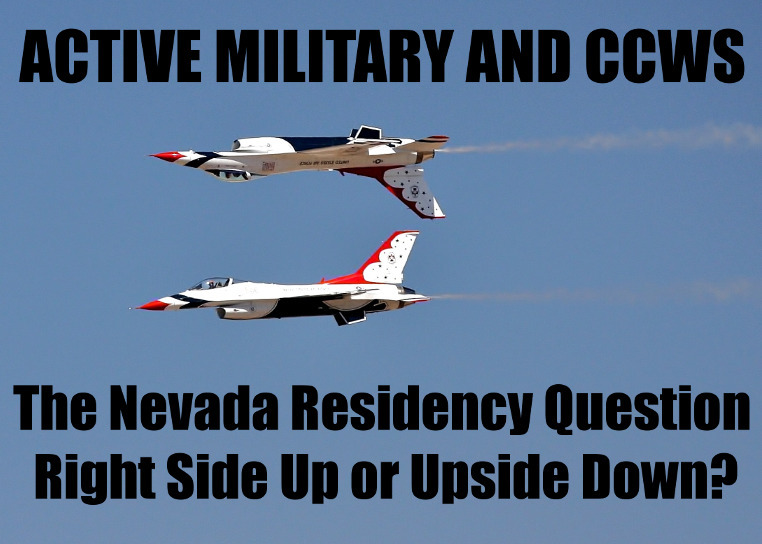 Many wonder if they can carry on their “home” state permit while stationed in Nevada. Sometimes, they even have a Nevada driver’s license. Normally, new residents have 60 days to convert an out-of-state permit to a Nevada permit…by taking the class and applying from scratch. This question often comes up when a serviceman or woman (or their spouses) wonder if they need to replace their out-of-state permit with a Nevada permit when they (or their spouse) is stationed here. First, temporary duty (TDY) wouldn’t count, but a permanent change of station (PCS) would. We’re not going to debate car registration, voting, and driver’s licenses, but rather, we’re going to look at what could get someone in trouble for carrying concealed. Nevada offers one permit to both residents and non-residents, so don’t think there are two classes. Non-residents just get to apply to any sheriff in the state, which usually means Clark County. In regards to drivers’ licenses NRS 482.103, living in Nevada and having a job (the military) in Nevada would seem to qualify one as a resident. (a) Whose legal residence [see above] is in the State of Nevada. So if you qualify for a driver’s license, then you probably qualify as resident under NRS 202.3657 and you need a Nevada concealed firearm permit. "the Court found that evidence of 'mailing address, voting registration, school attendance, medical care, business and financial affairs, auto and operators’ licenses, taxes, wills, and employment”' all in Nevada as well as a 'declared intention of Nevada residence and performed continuous daily activities in Nevada' supported a finding that a person was a Nevada resident. 50 U.S. Code Chapter 50, the Servicemembers Civil Relief Act, doesn’t really help. A legal brief from Creech Air Force base does rely on the military domicile concept (basically tax/voting purposes). What is essentially says (regarding driver licenses) is that if you are claiming Nevada as your residence for tax benefits on your paycheck, then you are a Nevada resident. This area is a quagmire. Even the Creech brief says “maybe” in answers. Like the Gun Free School Zones debacle, it’s a gray area. So what’s the brass tacks bottom line? If you are in Nevada and own a house or have a driver’s license, get a Nevada permit. That's the easy answer. If you get are detained and found to be carrying concealed, chances are the officer may not understand half of this. You may have some explaining to do if the officer questions why you have a Nevada DL but an Idaho CCW. A cop might let you go because whatever you did wasn’t that bad and they’re giving you professional courtesy for being in the service. Or they might be a vet and inter-service rivalry rears its ugly head. But as always, officer and prosecutorial discretion is not a plan.